You are at Home Food Adventures The Sustainable Eating Scene of Singapore! When you think about traveling to Asia and eating all the delicious food, sustainability might not be the first thing you think of. 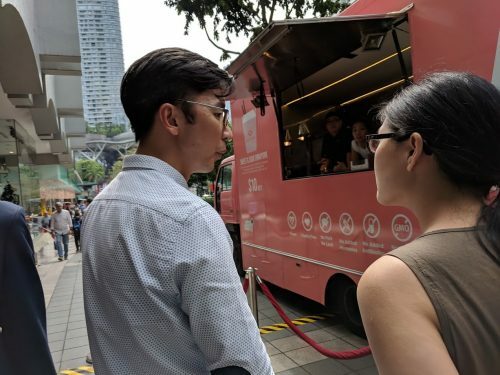 The sustainability scene for food is definitely stronger in North America and Europe but when we visited Singapore, I was happy to see that Asia is getting on board with the sustainability food scene. 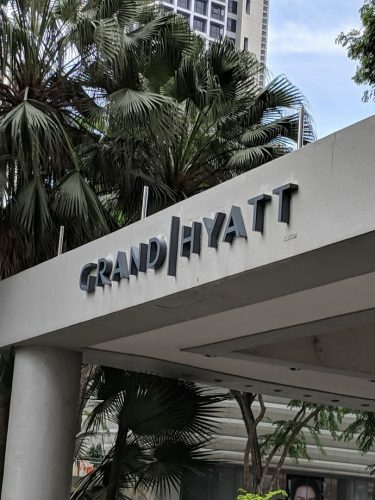 More specifically, the Grand Hyatt Hotel in Singapore! 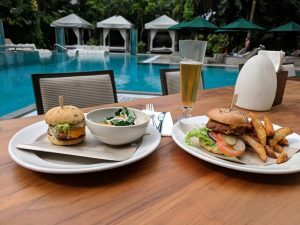 When I was doing my research on where to eat before heading over to Singapore, I came across people posting about eating plant based food at the Grand Hyatt. I was intrigued and dug deeper. The Grand Hyatt have been working with different organizations like Green Monday from Hong Kong to promote products like Omnipork. During the week we were in Singapore, the Grand Hyatt had a food truck set up outside their busy hotel serving Sweet and Sour Pork (made with Omnipork). Omnipork is actually made by a company called Right Treat. And interesting fact, Right Treat’s established food scientist team are based in Canada! 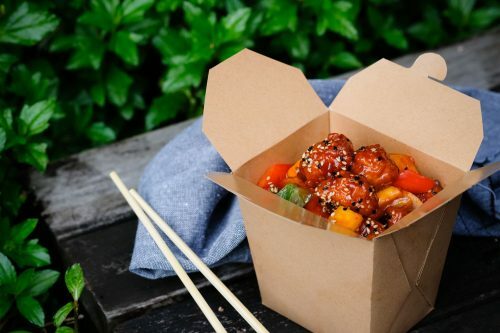 “They spend over 2 years of research & development to create Omnipork, a nutritionally superior analogue comprised of a proprietary blend of plant-based protein from pea, non-GMO soy, shiitake mushroom and rice. It contains 0mg cholesterol*, is antibiotic-free, hormone-free, cruelty-free, and 70% lower in saturated fat and 65% lower in calories than real pork, while offering much higher fiber, 333% higher in calcium and 53% higher in iron**.” Pork is actually the most consumed meat in the world and it is a very important ingredient in a lot of Asian cuisines. To introduce a plant based pork product in Asia is quite momentous. I tried some sweet and sour Omnipork and it was amazing! If you didn’t tell me that it was plant based, I would of never guessed. The texture was just perfect and I would definitely buy this product instead of pork to cook with! Most people have heard of the Beyond Meat Burger in North America, I actually didn’t have a chance to try it since A&W was sold out of it for awhile. 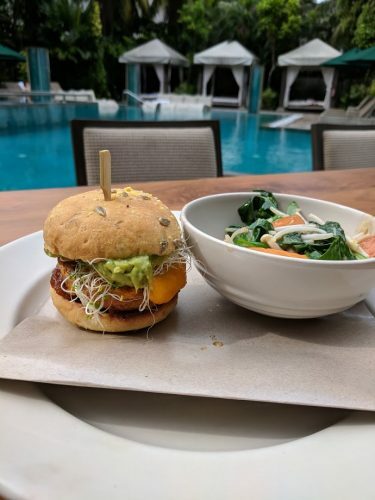 So I took the opportunity to give that burger a try too since the Grand Hyatt serves the Beyond Burger on the menu at the mezza9’s restaurant. If you haven’t heard of the Beyond Burger, they are a 100% plant-based gluten-free and soy-free burger patty (made with ingredients like pea protein and beet root). Both the texture and taste resembles real beef so much that people actually cannot tell the difference! Remember the days when we ate “veggie” burgers and they were so terrible? The Beyond Burger solved that problem completely! The Grand Hyatt in Singapore is actually the first establishment to serve the Beyond Burger! How cool is that? Ever since introducing the Beyond Burger, it sells more than the regular beef burger! Actions are louder than words, and I think it is pretty clear what consumers are looking for! Like the pork, this burger tasted just like a regular beef burger. If this option was readily available at all burger restaurants, I wouldn’t hesitate to order this instead of a beef burger any day! If you have the chance, give it a try! Another plant based first for The Grand Hyatt is Just Egg. Just Egg was created by a San Francisco based food innovator, JUST Inc. The product is so neat since you can use it like regular liquid eggs. My mind immediately went to making completely vegan baked goods with this product and I was so excited to try them out. The “eggs” are made out of mung beans and taste just like eggs. The creation of JUST Egg requires less water and fewer carbon emissions than conventional chicken eggs so it is truly a win win product! I am truly fascinated with this product and hope that they will available in Canada soon. I really want to try it out on a daily basis and see if I can replace eggs in my regular day to day cooking and baking! Again, the taste and texture for plant based products are key and JUST Egg nailed both! 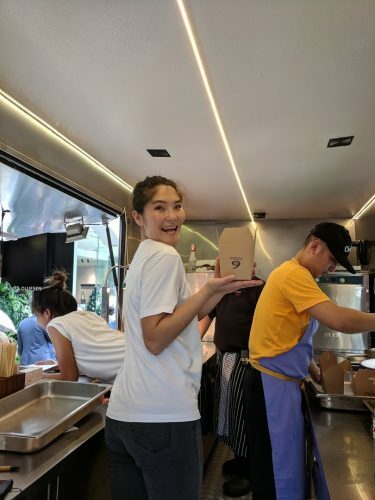 The Grand Hyatt served a JUST egg sandwich at their food truck outside their hotel early in November and people loved it! You can now order one for yourself at the Oasis pool side restaurant and give this plant based egg a try! I chatted with Gerald, Grand Hyatt Singapore’s Marketing Communications Manager about the hotel’s initiative on adapting more plant based foods on the menu and really being the pioneer in introducing change in the F&B and Hospitality industry in South East Asia. It was very refreshing to see and hear about how Asians are becoming more open to the idea of plant based items. Singapore is filled with foodies and if you serve food that doesn’t meet their high standards, you are not going to survive there and the people in Singapore love all the plant based items the hotel is bringing in, so you know it is definitely tasty! But more importantly, the views on plant based diets are changing. 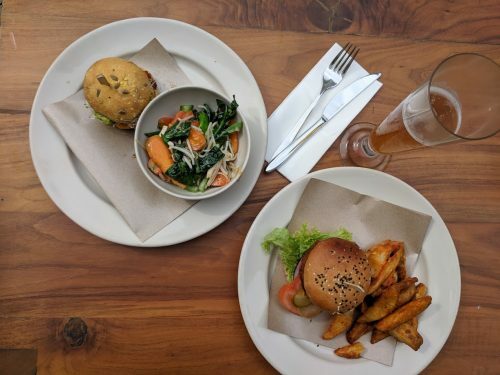 Initiatives like these are getting people to think about what they are consuming and how a single meal can affect the planet and the future generations. I am by no means a vegan or vegetarian, but the introductions of these delicious plant based items got me thinking more and more about what we consume today and how one day we may have to live without certain proteins like chicken, pork, beef. I hope to see more large companies like the Grand Hyatt think about their sustainability plans and adapt programs to actually make valuable changes. 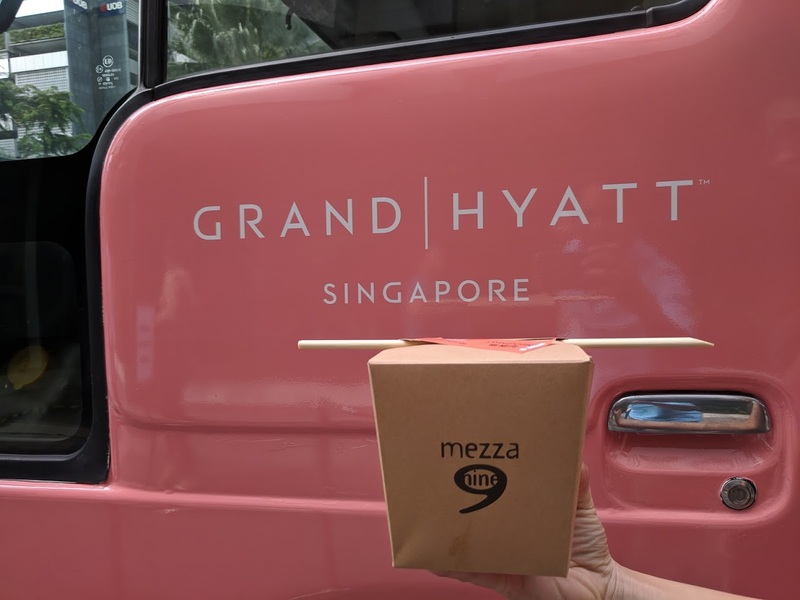 Other green initiatives the Grand Hyatt take includes an in-house waste management plant, a rooftop herb garden, and Singapore’s first plant-based Italian buffet at Pete’s Place. These initiatives make The Grand Hyatt a more attractive option for accommodation when we travel if they keep up these great programs! Thank you Andrew Noyes or JUST Inc and Gerald Kheng of the Hyatt Hotel for hosting us! 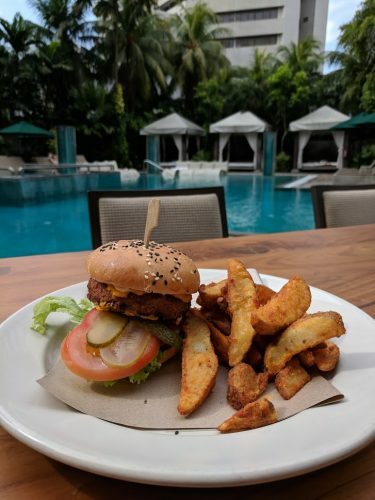 We can’t wait to discover more delicious plant based food next time we are in Singapore!